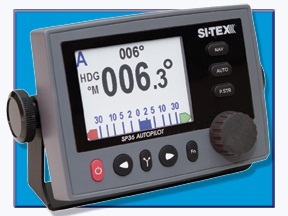 SI-Tex has expanded its leading autopilot line-up with the addition of the new SP36 Autopilot. The company’s most advanced pilot yet, the new Sitex SP36 has been designed to provide a wide range of powerboats and Commercial vessels with sophisticated steering functions and reliable performance under the harshest conditions at sea. • Auto Setup: Auto Drive Detection, Auto Tune, Auto Compass Cal. • Predefined parameter sets for Outboards, Inboard, Displacement, etc.